What would you do if you’re taking your dog for a walk in the countryside, and he suddenly hurts himself and begins limping, would you know how to treat him? 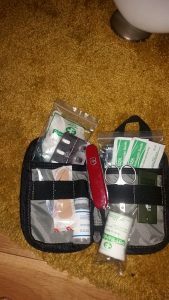 You would never go camping or hiking yourself, without a first aid kit, as you never know when something unforeseen could happen and you need emergency first aid. The same accident may happen to your furry friend, so always be prepared for an emergency situation by carrying a basic first aid kit for dogs with you on any walk. These supplies may help to comfort your dog until expert help arrives, and in some circumstances, may even save your dog’s life. When I’m out on my daily dog walks around Finchley, in the Parks and Woodlands, I always make sure I have my backpack with me, containing basic first aid kit items, so that I can give first aid treatment to any of the dogs. Of course accidents will happen and we never can know when an insect bite of a cut paw will hinder our pets. There are many medical items that you would normally have in a full first aid kits that you would use in your house or vehicle, but when out walking, obviously there are weight limits to what you are able to carry. Water – this is very useful for cleaning and treating minor wounds. It’s also useful for cooling an overheated dog, soaking a paw or rehydrating a pet. Manuka Honey – a natural remedy which can be applied to any type of infection or wound, burns or cuts to give instant relief. Of course we wouldn’t consider going anywhere without our mobile phone and credit card, you never know when you might need them, and so make sure your kit has these 2 essential items on the list! When walking with dogs, it’s always advisable to carry a list of contact telephone numbers, for the emergency services, the local vet, and if walking dogs for customers as I do, I always carry the client’s contact numbers in the event of any crisis. Your essential first aid kit can always to be used in the first instant to give emergency help to your dog, but always consider that there may be an urgent need to take your pet to the Vet to be checked out as soon as possible. Each year, hundreds of dogs in the UK are involved in medical emergencies; they swallow poisonous substances, suffer from heatstroke, or are involved in road accidents. Knowing what to do in such an emergency may save your dog’s life. Previous Article Previous Article: How important is it for your dog to wear a house collar with a name tag?